Core and application technologies will be developed in line with the promotion of Industry 4.0, and the up-. mid-. and downstream sectors will be integrated in connection with local, international, and future trends. Priority will be given to introducing smart manufacturing into large manufacturers and SMEs, making effective use of leverage and diffusion effects to stimulate rapid annual growth in production value. Between 2017 and 2020, an estimated US$70 million will be invested in the Central Taiwan Science Park and the Southern Taiwan Science Park to establish an intelligent robot self-manufacturing site as well as to cultivate new enterprises and train professional researchers. 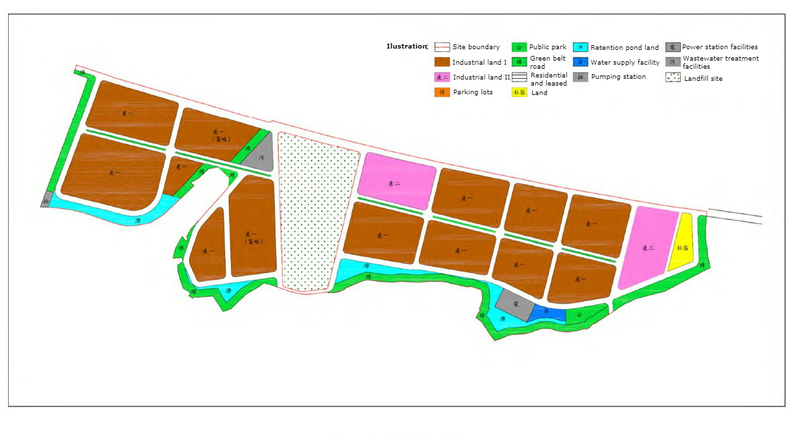 (2) Establishment of a Smart Machinery Development Center at Shuinan Smart City in Taichung. (3) Establishment of a Smart Machinery Industrial Park at Fengzhou in Taichung City as the home base for the manufacturing of smart machinery products. Central Taiwan is already an established center for the international machinery industry. 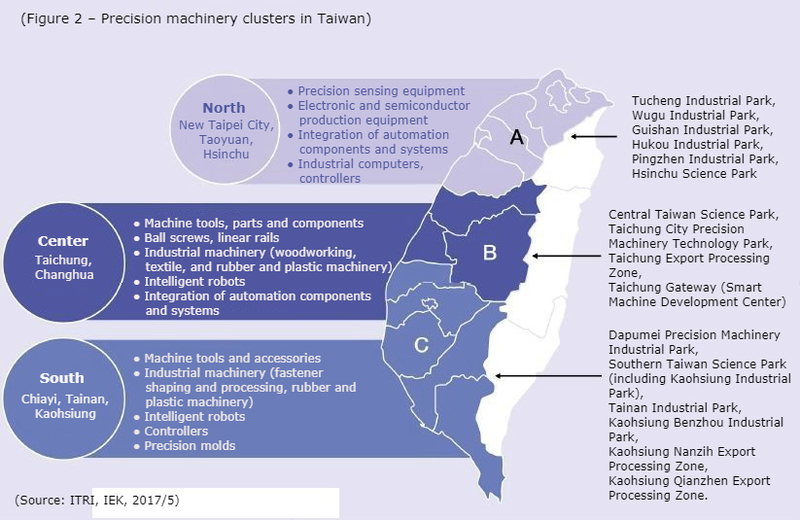 Additionally there is specific machinery industry clustering in specific areas of Taiwan, including clusters for machine tools and key parts and components, semiconductor production equipment, intelligent robots, and automation components. 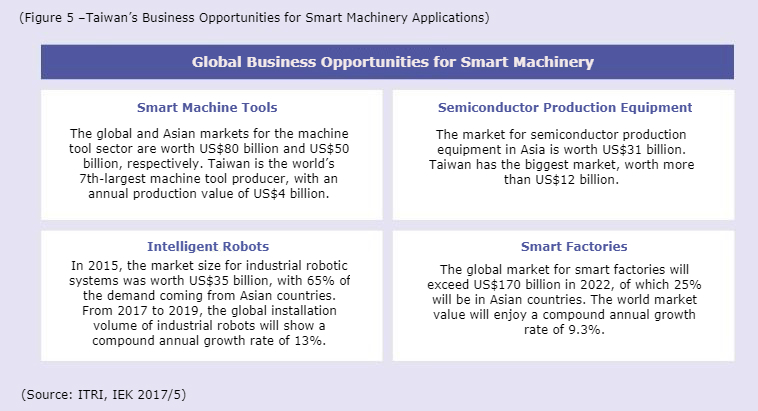 Taiwan is an important global base for the manufacturing of parts, components, and equipment for the information /communications industry and semiconductor industry, and Taiwan possesses industrial networks and systems for supporting the development of smart machinery. 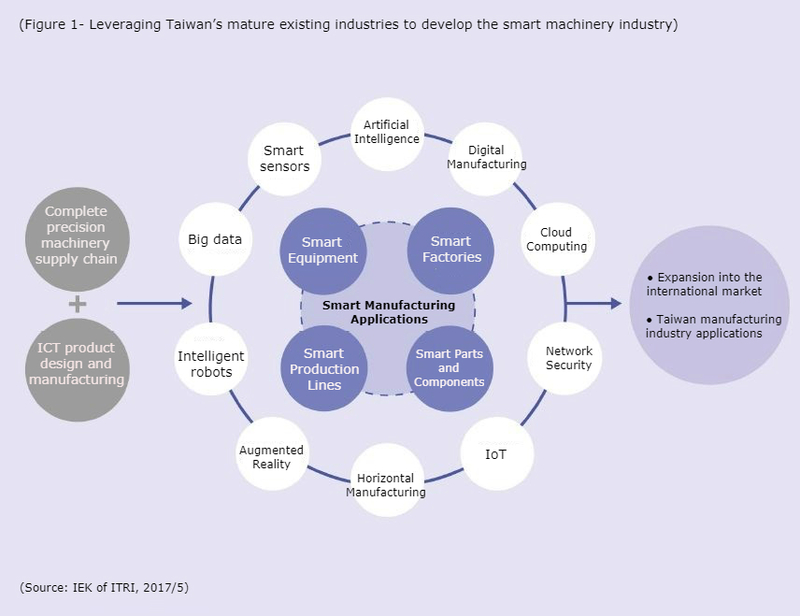 Taiwan has a clear advantage, in terms of parts and components, equipment, and supply chain, in supporting the development of the smart machinery industry. 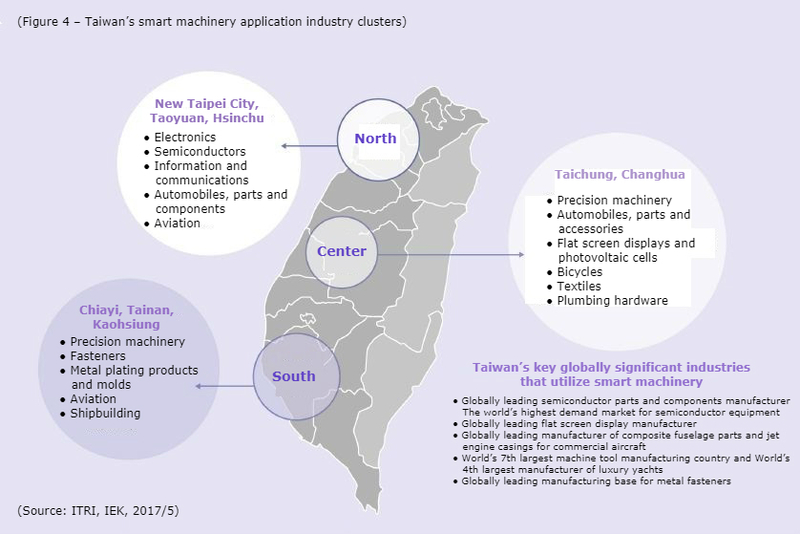 Taiwan has internationally competitive semiconductor and flat screen display, electronics and information/communications, automobile parts and components, bicycles, aviation parts and components, metal products, textiles, and other industries, all of which are main application markets for smart machinery products and solutions. 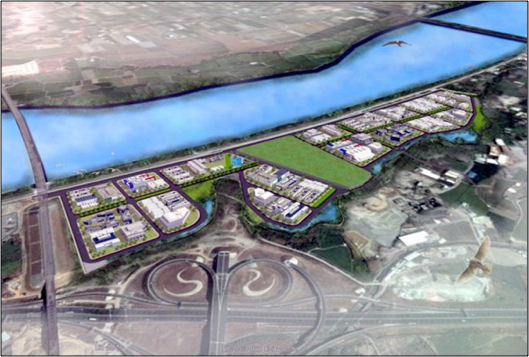 There are many science parks and industrial estates in Taiwan that offer an environment conducive to investment and the establishment of manufacturing facilities, including science parks in Taichung, Tainan, and Kaohsiung; the Shuinan Smart City and Fengzhou Smart Machine Industrial Park in Taichung, and the Dapumei Precision Machinery Industrial Park in Chiayi. International research firms and manufacturers can establish new companies or set up research and development centers or production bases in Taiwan, or engage in joint R&D ventures, technology transfer, or other means of joint participation in the development of Taiwan's smart machinery industry and the global smart manufacturing and applications market. (1) Taiwan is the 7th-largest manufacturer of machine tools in the world with a production value of US$4.62 billion in 2015, accounting for a 5-6% share of the global market. The smart machinery industry is expected to enjoy a compound annual growth rate of 2% up to 2019, increasing to more than 5% in 2023. (2) Taiwan's semiconductor industry continues to invest in advanced production processes. Firms in the supply chains of the information and communications, display panel, automotive, and electric vehicle industries are also investing in the installation of smart automated production lines. Lucrative business opportunities will derive from the stable growth in demand for smart machines. (1) Digital simulation and analysis, product life cycle management, big data analysis, machine learning, artificial intelligence. (2) Smart sensors, industrial and service robots, semiconductor front-end production and advanced packaging equipment, additive manufacturing, aerospace machine tools, and high-end controllers. (3) Solutions that span sensors and control devices, production equipment and production lines, and integrated information for smart enterprise operation. Visedo of Finland, a heavy-duty electric motor manufacturer, has entered into a joint venture with TECO for the production of high-performance motors and driver systems for ships and automobiles. The cloud computing unit of IBM of the USA has formed a strategic alliance with ASUS for the launch of a joint cloud strategies initiative and plans to launch HealthBot, a healthcare robot, in Taiwan. Safran of France and the Rolls-Royce Group have engaged in joint ventures with AIDC, Aerowin Technology, Magnate Technology, Drewloong Precision, and NAFCO for the production of parts and components for aircraft engines. Israel and Taiwan have engaged in joint ventures in digital manufacturing, high-end medical materials, new-generation communications, and information security. UL, a global safety testing firm based in the U.S., will establish a test center for IoT. Siemens of Germany and Yencheng Machinery have jointly developed solutions for pharmaceutical machines to help speed up research and development in biopharmaceuticals in Taiwan.